The rains continue in Lilongwe, promising a strong harvest and prosperity in the coming year. Some villages have begun to see shortfalls in last year’s harvest as they scramble for other sources of sustenance such as cassava and potatoes grown in their winter gardens during the dry months. This week, we saw the results of the water quality test we performed on Friday, 14 January 2011. Just looking at the coliform count plate tempted my gag-reflex: there were 29 colonies of E. coli in 1 ml of Mziza’s drinking water. According to World Health Organization standards, 1 to 10 colonies per milliliter represents a high risk of illness and greater than 10 colonies represents a very high risk. We are discussing ways to improve the water quality at Mziza. Ideas range from covering the well to solar purification. Covering the well is a must, but may not be sufficient to keep contaminants out. The bucket is thrown into the well 50 times a day, depositing bacteria and food for bacteria each time. Putting a pump on the well will reduce the contamination due to fetching water. Protecting the pump from wind and dirt will also reduce the amount of bacteria in the water. In the end, the well may not be deep enough to eliminate contamination from run-off. We tested bore-hole water from an enclosed suction pump at Mgwayi village, approximately 40 miles from Mziza, and discovered 1 E. coli colony per milliliter: a high risk water source. The question remains open on the best method of fetching, pumping, storing, and purifying water, and there is no silver bullet. 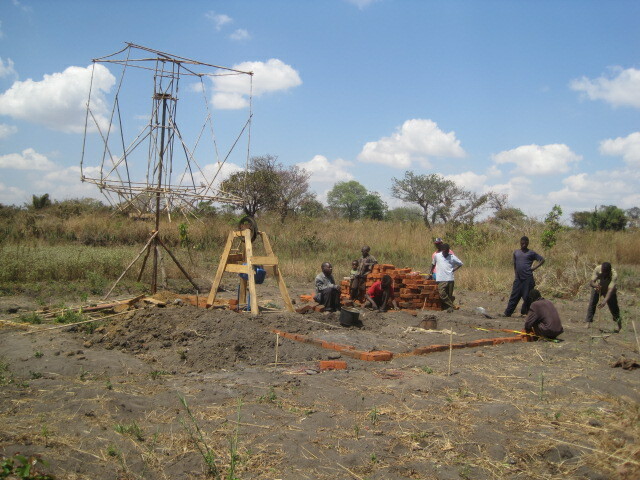 However, we will make some changes to the well at Mziza and continue testing the water. In the meantime, we will encourage people to use chemical treatments or boiling to purify their water.